Chotukool is a 35-liter, solid-state electronic cooling device that uses no compressor or refrigerant. The device cools up to 28°F below room temperature to maintain the natural flavor, humidity and nutritional value of food. After achieving an inside cooling temperature of 10°C, the device cuts off electricity and goes into sleep mode. Chotukool stays cool for up to three hours without electricity and recharges on both AC & DC power sources. It works with an inverter or battery and is also car charger-compatible. Plug Power: 230V AC. Inverter: 12V DC. 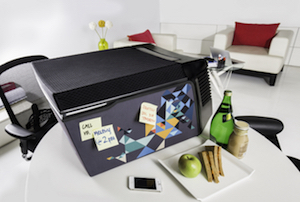 The device consumes just 62W - 30% less energy than refrigerators - and requires lower running costs.